올림포스, 터키의 딥 그린 방갈로 | 호스텔월드에서 예약하세요. Deep Green is located in Olympos Valley, in a large orange garden, surrounded by the natural pine forest. 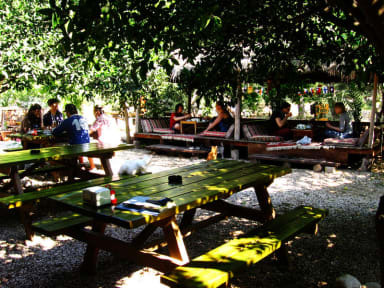 Deep Green offers a calm, peaceful and cheerful social atmosphere with a cosy bar, garden restaurant, hammocks, burning fire, TV room. Deep Green Bungalows is only 10-15 minutes walk far from the magnificent Olympos beach. The bungalows are independent and surrounded by orange trees that makes our guests feel more comfortable and relax on holiday. Both the private bungalows and dormitories are available. All of the room rates include breakfast and dinner. For more details ask reception. 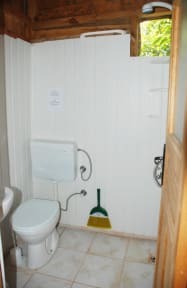 All rooms (private bungalows & dormitories) have private bathrooms (shower and wc) and cabinet. Hot water is available all day. All of the private bungalows and dorms have air conditioning. Wireless internet connection, library, and games are avaible and free of charge. Is waiting for you with meticulously chosen music, fire, reasonable prices and live music from time to time. Depending on the route preferences and weather conditions, Ceneviz Cove, Sazak Cove, Coban Harbour (Pirate Cove) or Suluada (Water Island), American Cove routes can be visited. The trips are all day trips and departure time is 10 am at Deep Green. Lunch (fish-salad-macaroni/pilaf), hot drinks and fruits are included in the trip price. Booking a day before is highly recomended. Every evening after dinner Yanartaş Trips are organized so that you can see the eternal fire and enjoy the landscape. Trekking; Olympos Ancient City is located on the Lycian Way, and have many lovely walking parcours.